Well, we have seen many websites like bit.ly, goo.gl, and also the $$ earning adfoc.us and adf.ly. Ever wondered how these systems work? Well, I don't know how exactly do they work, but I can show you how to create something like those websites. 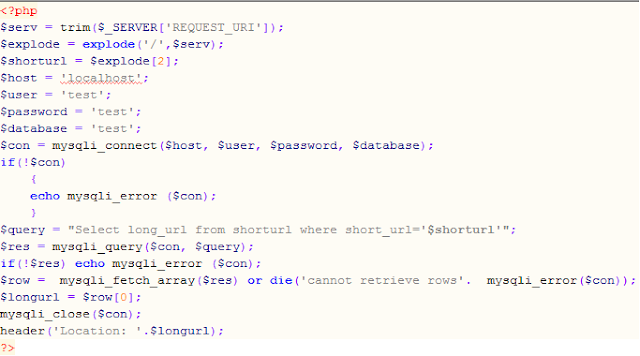 The concepts that we will be using to create own URL shortner are: MySQL access functions in PHP, and the header function in also, PHP. If you are using Apache as your server, save a file called ".htaccess" in the main directory of your website. The directory in which your index.php lies. Now we are going are going to write the code for redirect.php. Well, we did the htaccess thing so that whenever some random piece of string goes behind your web domain name, a 404 error occurs. Now, to show that 404 error, we fire up the redirect.php, that is basically a redirecting PHP script. In handling the .htaccess file, make sure your correctly enter the address of the location of your redirection script. Make sure you enter the path as on server, not as your local domain. There are lot of things I haven't included in the script, which include analytics, form to create new URLs, and an error page if the code is not found. Explore them on your own! Well, when you are starting a service, you will obviously need to set up a random code generator for new URLs. Here is a small example on how you can create random alphanumeric codes that can be used as your short URLs. Got more tips? Share them in comments.